Below are informative links of interest to anyone planning any sort of backcountry trip. 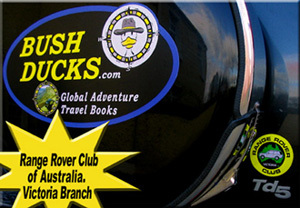 Range Rover Club of Australia (Victoria Branch Inc.) Large and active Australian club -- all makes of 4x4 welcome. Jeepsites.biz Find quality vehicle-related sites. ATV Camping Accessories Your Premier source for information and lightweight gear, supplies, and accessories for ATV camping..
Colorado Association of 4 Wheel Drive Clubs Inc. Umbrella organization for Colorado clubs. The site has many trip planning resources and land use information. Atlantic British Land Rover Parts and Accessories Atlantic British is North America's oldest and largest independent supplier of premium Land Rover parts and accessories for all Rover Vehicles. Land Rover Exchange The best place on the web to buy or sell Land Rover vehicles or parts. Also an active Q & A forum. Adventure Travel Tips! Click to search the world for adventure! Snow levels - Colorado Updated daily - Snow Precipitation Update for Colorado. Data from NRCS Snotel sites. Wildernet Much outdoor information, primarily on Colorado National Forests. Many jeep trail descriptions. Tread Lightly The Tread Lightly page contains common sense ethics for minimizing the impact on the environment. Pacific Northwest Backroad Adventures Blog and forums provide valuable information on touring the back country roads of the Pacific Northwest. Free organized group tours throughout the year. Royal Canal Court Apartments Excellent and affordable summer self-catering in Co. Kildare, Ireland.